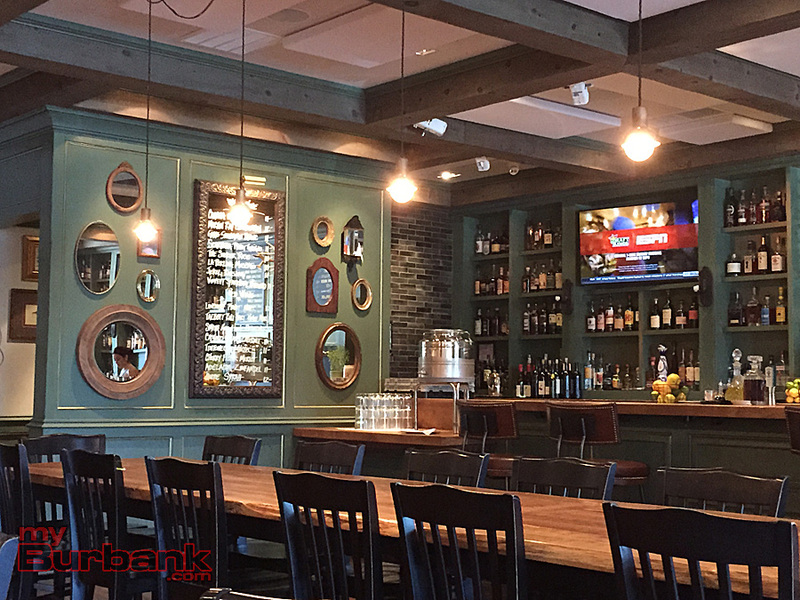 Since Forman’s Tavern opened in Toluca Lake about six weeks ago, the public house has settled into the neighborhood quite nicely with consistently excellent food, a comfortable vibe and decor, along with friendly, expert bartenders. 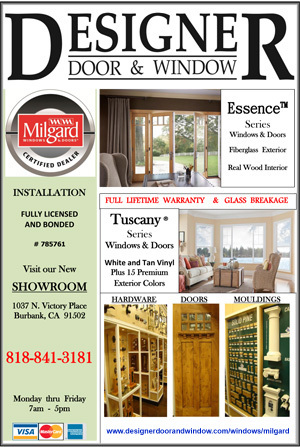 A breath of fresh air for Toluca Lake and Burbank! Serving the same, large menu at lunch and dinner, the offerings range from small plates to heartier entrees, burgers, sandwiches and salads. Forman’s serves up a nice menu of beers, IPAs and wines, along with colorful, creative cocktails. We have stopped by Forman’s Tavern several times in the past few weeks, late at night and for lunch. Every visit has been pleasant, from bar atmosphere to the quality of the food and drink. At night, a bouncer checks i.d.s and the place is busy inside. We still were able to find a seat at the large community table in the center. The tavern is dark, punctuated with atmospheric lighting. Fortunately, the place isn’t overly loud, like many bars can be. During the day, Forman’s does a steady business for lunch yet finding a nice table at which to sit is pretty easy. The pub is light, bright and expansive. At Forman’s, we’ve had one of the best burgers we’ve tasted anywhere in the United States, the Steakhouse Burger. At $14, the diner gets their money’s worth. Ground fresh daily, the meat is perfectly cooked to order. A medium burger melts in the mouth, with an incredible flavor. 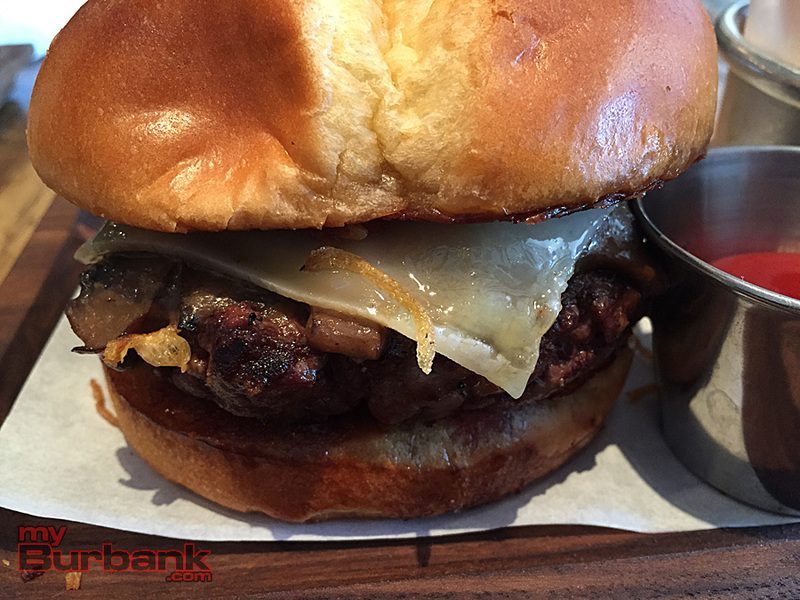 Topped with braised mushrooms, Gruyere cheese and crispy shallots and placed inside a potato bun, Forman’s Steakhouse Burger is simply perfect. Hand cut fries are available separately, and are expertly crispy, potato-y and a little picante. 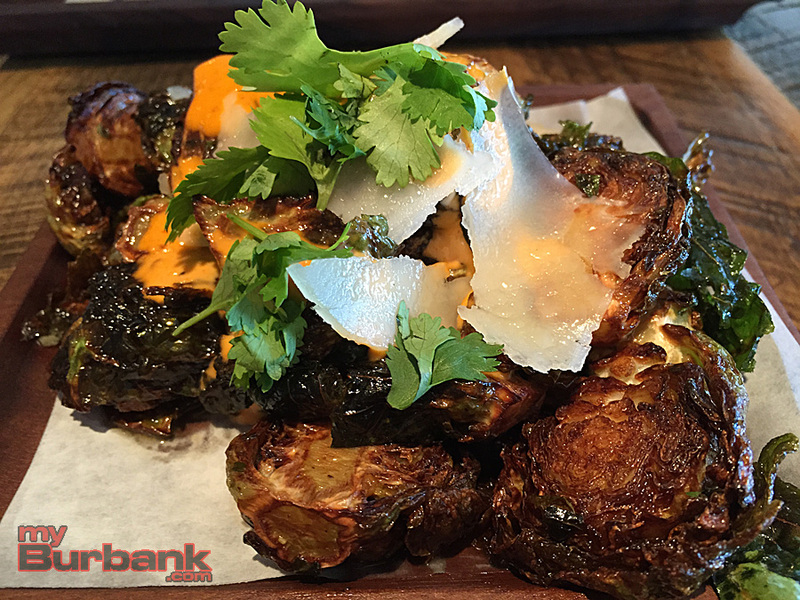 Forman’s Brussels Sprouts ($7) are a thing of beauty – crispy and chewy with a hint of citrus, heat and nutty, salty cheese. 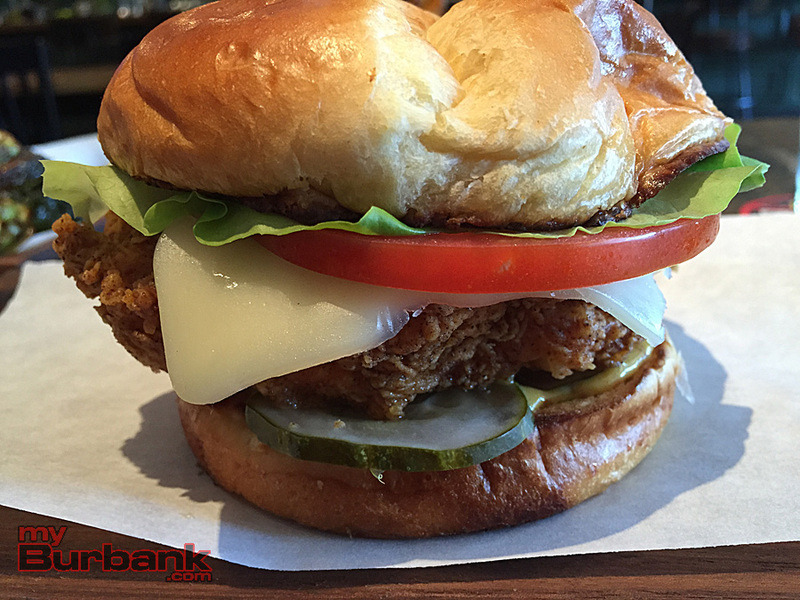 The Crispy Chicken Sandwich ($13) is slightly spicy and juicy. A fried chicken breast is topped with Swiss cheese, lettuce, tomato, pickles and a tangy sweet honey mustard dressing on a potato bun. And then there’s Forman’s salad menu, which looks fantastic, from Kale Salad, Citrus & Beet Salad, Quinoa & Berry Salad and Farro Salad to Fried Chicken Salad, Ahi Tuna Salad and Grilled Steak Salad. 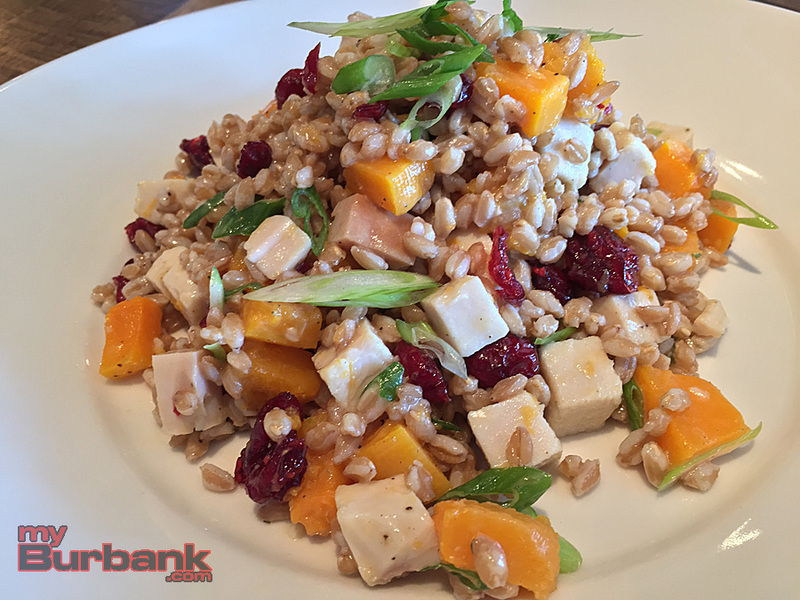 The Farro Salad ($14), made with nutty farro, house-smoked turkey, tender butternut squash, cranberries, green onions, lemon and olive oil, is tangy, slightly sweet, filling and absolutely perfect. Another spectacular dish is the Lemon & Ale Mussels. If we had one critique, it would be to request more grilled bread to accompany the dish, with which to soak up the fragrant, lemony, sea-flavored broth. 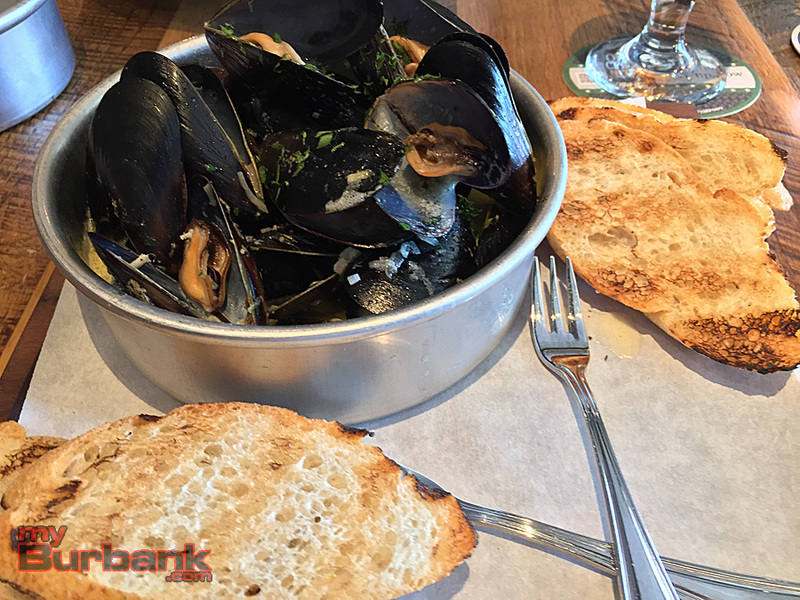 For $15, the plate is a huge stack of mussels steamed with Belgian ale, lemon and parsley. Five slices of sliced, grilled bread are served alongside. 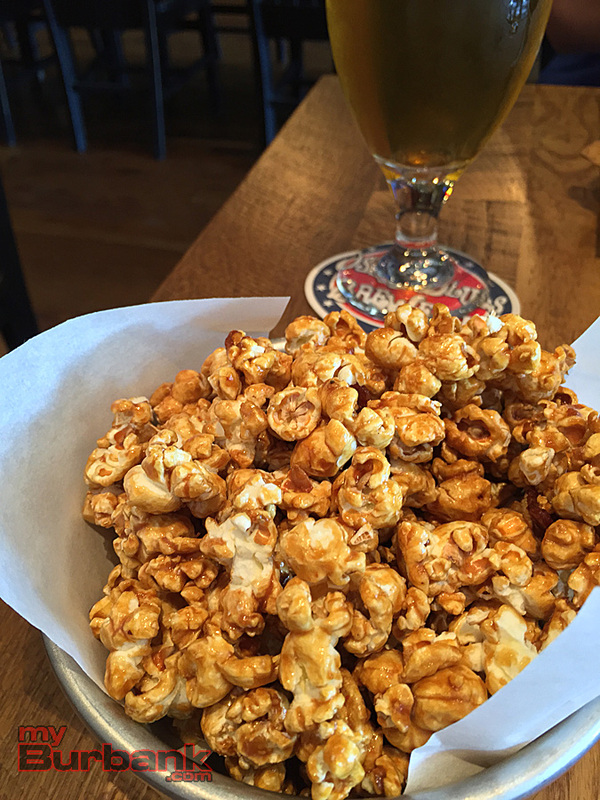 We also tried the Spicy Bacon Caramel Popcorn ($6.) The combination of flavors worked really well, although perhaps a little more bacon could have been present. The sweetness of the shared plate worked well as a dessert. Forman’s bartenders make excellent cocktails. The Old Fashioned is served over a single huge cube of ice and garnished with a lemon twist – strong and classic. The Rosemary Paloma is tangy and fresh. 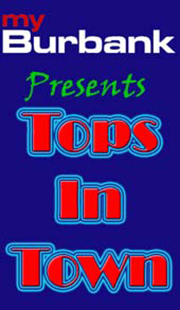 Most cocktails range in price from $10-12. Forman’s wine and beer list is solid as well. We’ve tried several varieties on tap, including the Dog Fishhead 90 IPA, Old Chubb Nitro, Big Whig IPA and the Lagunitas Pils. Prices range from $7-9 a glass. At Forman’s Tavern, no detail is forgotten. The bathrooms are clean and charmingly decorated. The main room is large and open, with lots of hunting lodge and country-inspired accoutrements. Eating at Forman’s is a visceral, slightly messy experience. Be prepared for some sticky fingers! Patrons find their own seats and order food and drinks at the bar. Runners bring the plates out from the kitchen to the tables. 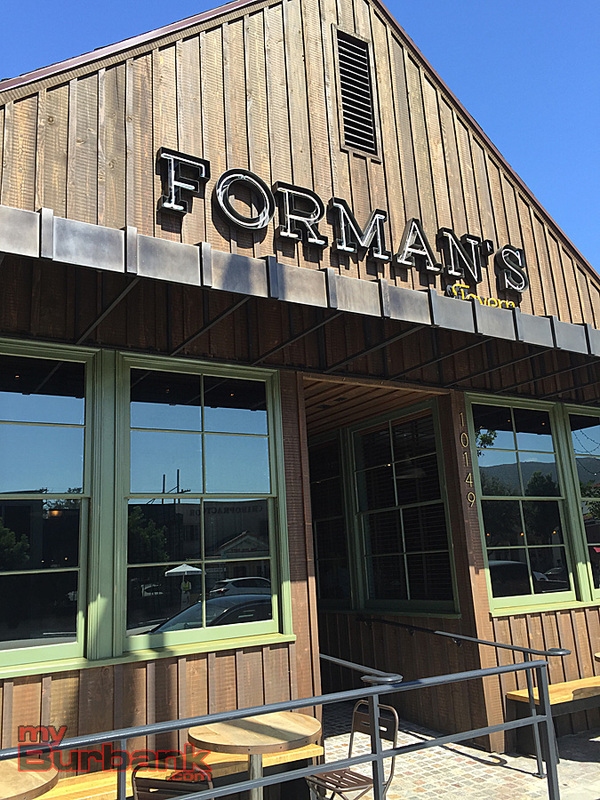 Forman’s Tavern is on Riverside Drive in Toluca Lake, so be prepared to valet or park and walk. 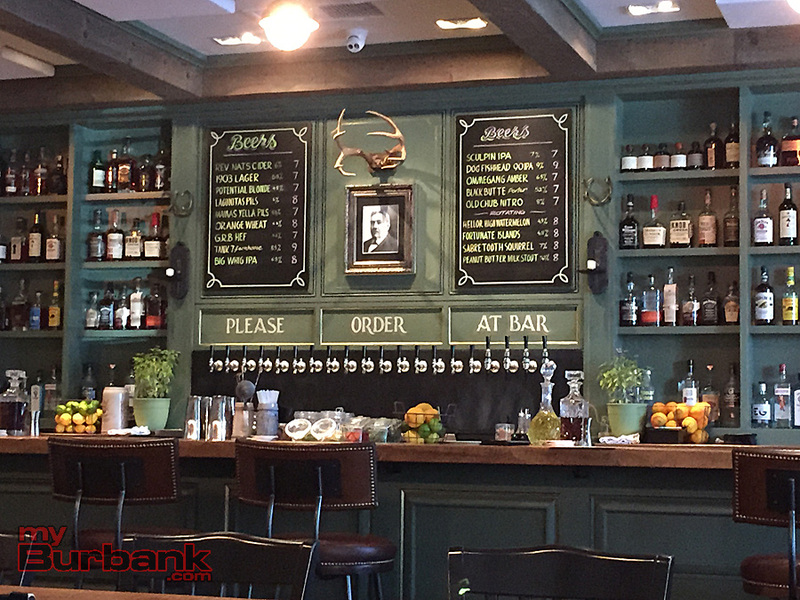 For consistency, style and substance, Forman’s Tavern gets a resounding Tops In Town. 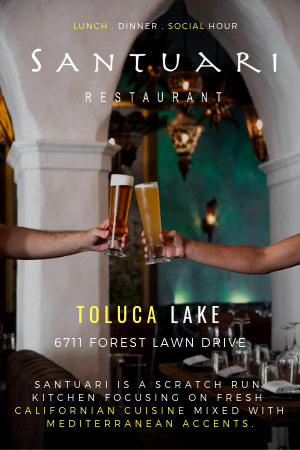 We are thrilled to find an excellent casual place for late-night dinners and drinks, close to Burbank, with a little more sophistication than the usual suspects. 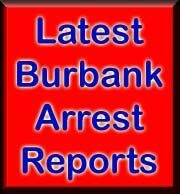 Restaurant Info: Forman’s Tavern is located at 10149 Riverside Dr., Toluca Lake, CA, 91602. 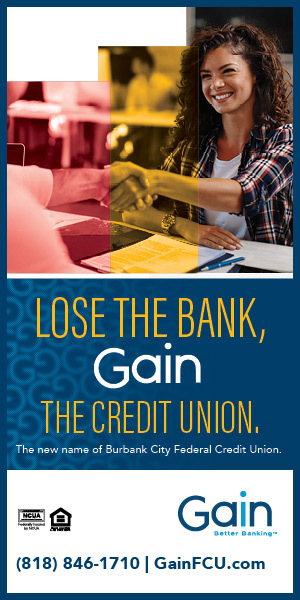 818-760-6900. 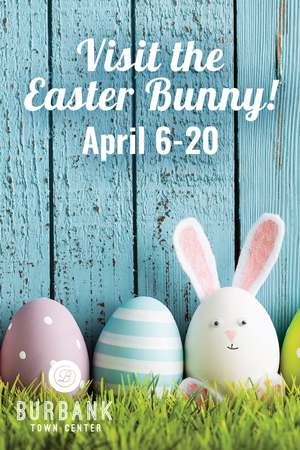 Forman’s Tavern is open Monday through Sunday 12:00 p.m. to 1:00 a.m. 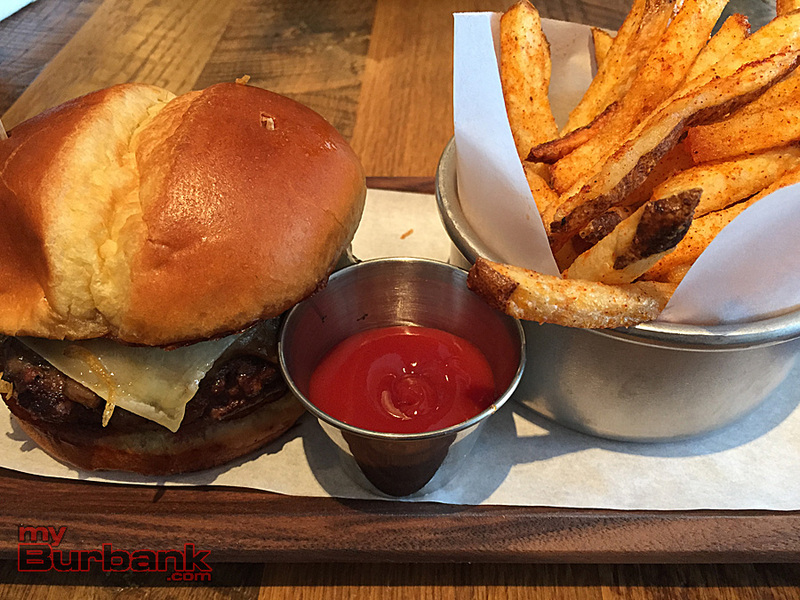 This entry was posted in Food, News, Nightlife and tagged burbank bar, burbank dinner, burbank late night, burbank lunch, formans tavern, Toluca Lake, tops in town on October 5, 2015 by Lisa Paredes.